It’s been almost two weeks with Cedar and so far she is showing great promise during her training. She started out fairly high wieght, as nearly all newly trapped birds do, and has been manned down to training weight (around 850g) and continues to progress through the steps. The manning process took about two hours each day for the past week and we continue to spend time together to get used to one another. 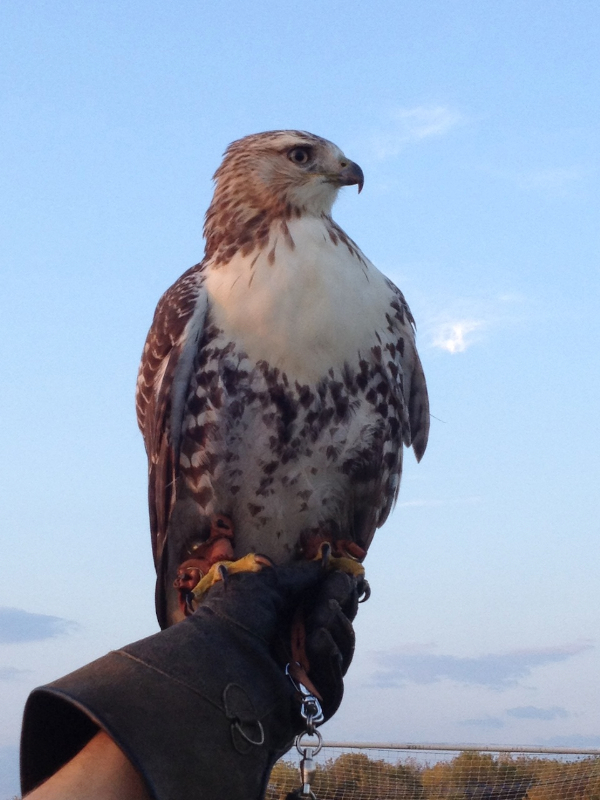 So far, the most impressive feature about Cedar is her light colored feathers on her head and neck. She has a full white breast, with the distinctive immature belly band. Her breast feathers are very thick and it gives her the appearance of being larger than she actually is. The other thing that is amazing about this animal is her temperment. She is manning down very easily and allows all the handling and attention that new birds get without any issues. She sits on the glove very comfortably for long periods of time. She accepts a hood without any bating or issues. The other day, I was sizing hoods for her and she sat on the glove while I tried on 5 different hoods to get the proper size. She did not bate once. I’m truly excited about her personality and am excited for her training to progress into the hunting excercises.